The CEO's question of "How are we doing?" can strike fear into the hearts of executives responsible for corporate philanthropy. Unlike almost every other area of corporate activity, there are no tried and true methods for benchmarking philanthropic performance. Beyond counting the volunteer hours and dollars given away, companies are left to determine the value and impact of their philanthropy in a vacuum. 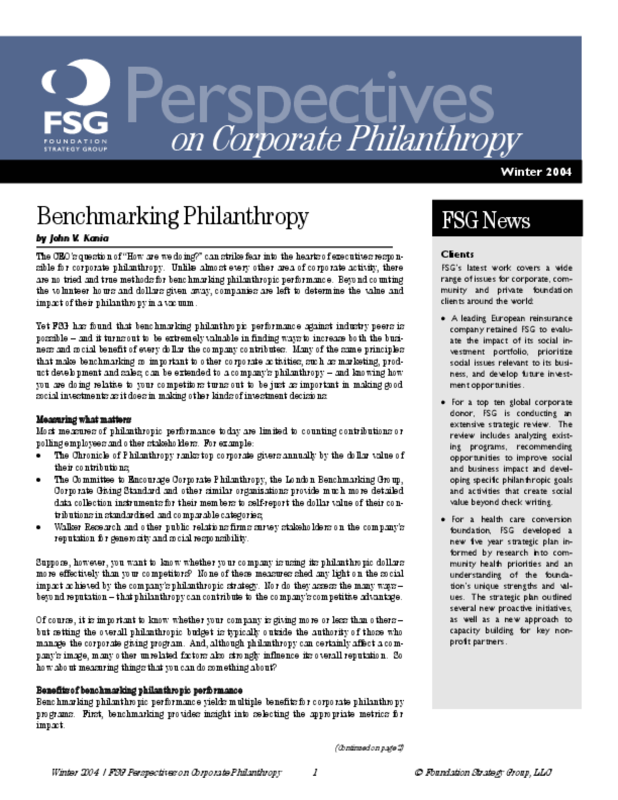 Yet FSG has found that benchmarking philanthropic performance against industry peers is possible -- and extremely helpful in finding ways to increase both the business and social benefit of every dollar the company contributes. Many of the same principles that make benchmarking so important to other corporate activities, such as marketing, product development and sales, can be extended to a company's philanthropy -- and knowing how you are doing relative to your competitors turns out to be just as important in making good social investments as it does in making other kinds of investment decisions.